NETWORK FINALS: the OJ SIMPSON rerun special on FOX lost 0.1 in final numbers. CABLE HIGHLIGHTS: TBS’s Elite Eight NCAA TOURNAMENT games towered over Saturday cable at 3.03/2.17. A&E’s LIVE PD edged up 0.02 to 0.69. The KIDS CHOICE AWARDS was one of those occasional specials that bridges the air of Nickelodeon and Nick At Nite, resulting in a 0.49/0.46 rating; in addition, the show aired on TeenNick at 0.09, and Nicktoons at 0.04/219K. Similarly, lead-in HENRY DANGER was at 0.37 on Nickelodeon, 0.04/158K on TeenNick, and 0.03/178K on NickToons, and lead-out KNIGHT SQUAD was at 0.27 on Nick At Nite, 0.04/143 on TeenNick, and 0.03/170K on Nicktoons. The Adult Swim late-night block performed as follows: DRAGON BALL at 0.45/0.37, compared to last week’s 0.48/0.39, BLACK CLOVER down 0.03 to 0.27, JOJO’S BIZARRE ADVENTURES down 0.05 to 0.21, MOBILE SUIT GUNDAM down 0.03 to 0.19, HUNTER X HUNTER up 0.01 to 0.22/483K, NARUTO up 0.02 to 0.24/506K, SPACE DANDY steady at 0.22/444K, two episodes of COWBOY BEBOP at 0.22/430K & 0.20/406K compared to last week’s 0.19, and GHOST IN THE SHELL up 0.04 to 0.19/376K. 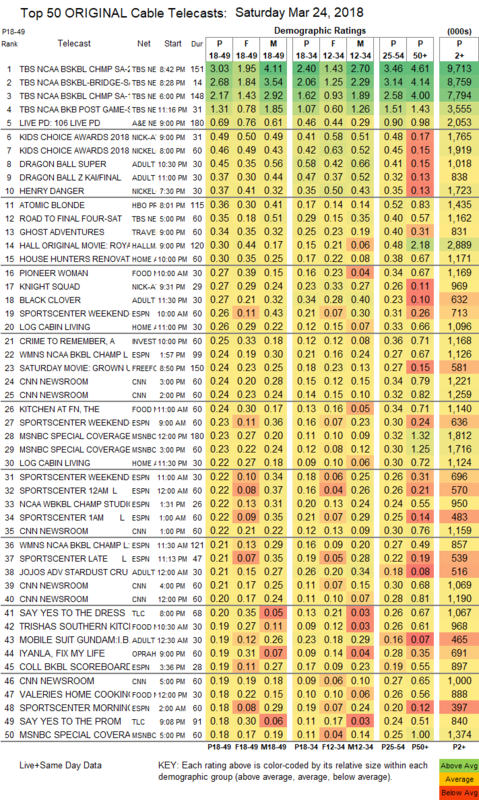 Travel Channel was in the Top 13 with GHOST ADVENTURES at 0.34. Hallmark’s original movie ROYAL MATCHMAKER was at 0.30. HGTV’s HOUSE HUNTERS RENOVATION gained 0.05 to 0.30, and LOG CABIN LIVING was up 0.05 to 0.26. On Food Network, PIONEER WOMAN held at 0.27, KITCHEN AT FN ticked down to 0.24, TRISHA’S SOUTHERN KITCHEN lost 0.03 to 0.19, and VALERIE’S HOME COOKING ticked down to 0.18. ID’s A CRIME TO REMEMBER rose 0.03 to 0.25. TLC’s SAY YES TO THE DRESS gained 0.02 to 0.20, and the follow-up shows were at 0.18/0.13. On OWN, IYANLA FIX MY LIFE climbed 0.02 to 0.19, and THE BOOK OF JOHN GRAY was at 0.12.